When is an ultra run like a prize fight? A face plant on the second lap of the course gave Barb a black eye and a swollen lip, plus several other bruises. This photo was taken the day after the race. If the weather is nearly perfect, and the trails are dry, the light is good and there are no obstacles per se, how does a trail runner come out of a race looking like she’s gone through a 10-round prize fight? It’s those pesky tree roots on a narrow single-track trail. At least that’s the story my wife, Barb, is offering. Barb was looking for an extra challenge as her 50th birthday approaches in early 2014. After I did a 50-mile trail run earlier this year, I suggested she try an ultra — and she bit. She thought 50 kilometers (31 miles) was crazy enough, so she decided to run the Farmdale Trail Run, which includes a 30-miler. To make it a 50K, she added a 1-mile jog before the race even began. Due to the federal government shutdown, the race was moved in the last week to Jubilee College State Park, which is located just north of Peoria, Ill. The original site was supposed to be just south of town, but Farmdale is operated by the Corps of Engineers. There were a few showers in Peoria before the race started, but when we arrived at the park, the trails were dry, and the conditions were really perfect for a run. The course was mostly under tree cover, single-track and — although there were some steep sections — along rolling hills. Barb wanted to complete the run in under 8 hours, and she kept up a very steady pace and met that goal, finishing in about 7 hours, 43 minutes. The biggest challenge was staying on her feet, but she wasn’t alone. Despite the nearly perfect conditions, there were a number of tree roots on the single track, and if you weren’t careful, it was easy to snag a foot. I noticed an inordinate number of runners who came across the finish line with their shirts covered in dirt or their arms and legs covered with trail rash. But I think Barb got the prize for the day. She fell at least once on every lap, and she did an epic face plant on her second lap and rolled into a log. That resulted in several bruises, plus a swollen, black eye and a fat lip. Trying to take a drink from her water bottle on the next lap, she just laughed. Every time she tried to squirt in water, it dribbled out the side of her mouth due to the fat lip. One more example of women being tougher than men. 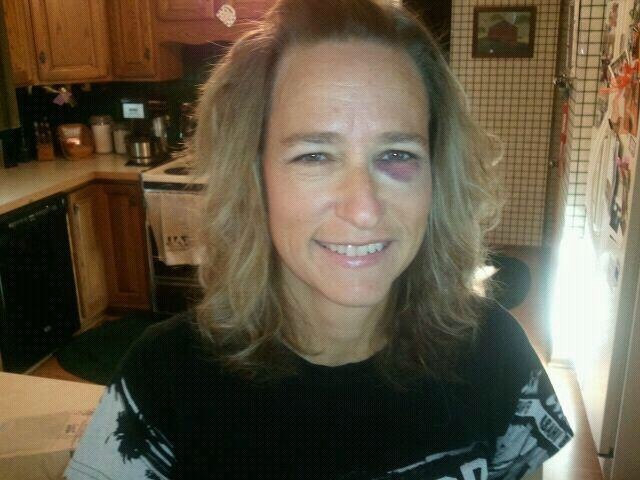 The day after the race, Barb is sore and tired, and her shiner has made for a hell of a conversation piece. She said she looks like she’s been fighting for Team Miesha, referencing the UFC television show. But after a few extra ibuprofen, she’s doing some chores and made a great seafood chowder for lunch. I think she’ll forget all about her sore muscles by the time the Belize marathon rolls around in early December. At least I hope so. And if you haven’t read my post about the 50-miler I did earlier this year in nearby Pekin, Ill., here’s a link to that article. It’s a great race, and it also includes 100- and 150-mile options. Start of the 2013 Farmdale Trail Run, which was actually held at Jubilee College State Park near Peoria, Ill.
Barb’s favorite ultra race nutrition: Campbell’s chicken noodle soup. A cut and dirty leg was just part of Barb’s war wounds. One of the wider sections along the trail, which was mostly single-track. Crossing the finish line after a 50K. The race was officially 30 miles, but Barb ran 1 mile before the start to make it 50K. Today was warm and sunny and a great day for a long run. The temperature was unseasonably high — mid-50s– for Iowa in January. I was pleased with today’s run. Here is a map of the run. I use either Endomondo or MapMyRun to live-track my runs so the family knows where I am. The run-walk approach is helping me complete the runs without getting too beat up. I used a 5-minute run, 1-minute walk pattern, which I also utilized on Friday’s 7-miler. I am pairing fairly long runs on back-to-back days in order to simulate the stress of the ultra. I will continue to lengthen these runs in the coming weeks. The Million Dollar View from Keokuk’s Rand Park showed blue skies and a blue Mississippi River on a gorgeous January day. I ate a package of Power Bar Energy Blasts on the run. Only the second time I have used them, and today’s lemon-flavored chews were yummy! I normally eat Honey Stinger Energy Chews, and they are very good, too. But I’ll have to add the PowerBar chews into the mix. Unfortunately, I suffered from some nausea after the run. This is generally not a problem for me, so I reviewed this article and this article on the malady. Since the ultra in April is on trails, that brings a new challenge for me. I ran a marathon on the Wabash Trace trail in Shenandoah, Iowa, in September, but that was on a converted railroad bed. It was wide and flat and covered with crushed limestone. The Potawatomi Trail run is on a more traditional trail: some single track, some grass, and plenty of ups and downs. Or at least that’s my impression, after reading about the race. I think I need to scout the locale. If the timing works out, I’m going to head to Pekin next Saturday for a trial run. Proof that it was nice enough to run in shorts in January. I’m concerned I may need to get some trail shoes to handle the terrain. Not knowing how many trail races I’ll run, I’m not sure I want to invest in another pair of shoes. But a trial run will help answer this question. I do think I’ll invest in some gaiters. In preparation for the trails, I am running on the shoulders and the grass as much as I can. Today, I got a rock in my shoe in pretty short order. This also was a bit of a problem on the Wabash Trace. Eleven weeks until race day, and there’s still plenty of work to do.